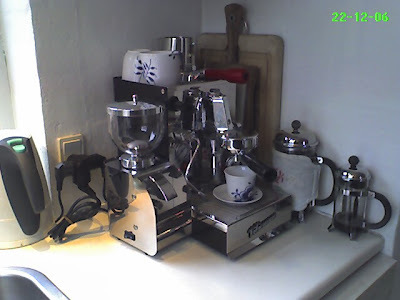 Having owned a VBM domobar (single boiler) and Isomac Granmacinino grinder, which are both great espresso equipment, I was hit by the famous upgrade fever. It started when I found a second hand ECM Giotto Classic which I got in a quite good deal. After having sold the Isomac grinder I started looking for grinders at eBay. 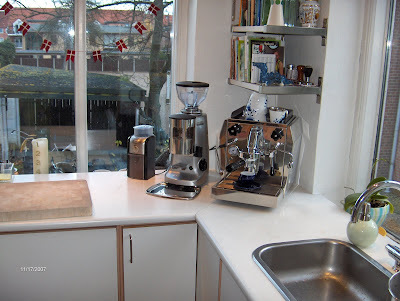 The grinders I bid for were primarily La Cimbali Junior and Mazzer Mini/Super Jolly due to the great reviews at e.g. http://www.homebarista.com/ and http://www.coffeegeek.com/. I ended up with both a Junior and Super Jolly. Both are fantastic grinders with each their pro's and cons. I think I'll end up with just the Mazzer SJ as this is the one my wife prefers.